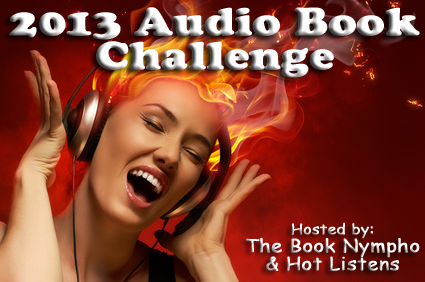 I've become a HUGE fan of audio books in 2012 and thought why not challenge some of my other blogger/reader friends to find the joy in listening to audios. They are great for those times you want to read but can't for some reason like driving to and from work, doing house chores, working out in the gym, etc. I know some of you are thinking, audio books? Pass. I thought that once too. But when you find a great narrator they can make the story even better. There are some series I will only listen to because I love the narration so much. And what better co-host to have for an audio book challenge than Lupe from Hot Listens. She's the queen of audio books. Runs January 1, 2013 – December 31, 2013. You can join at anytime. The goal is to find a new love for audios if you are new to them or to outdo yourself by listening to more audios in 2013 than you did in 2012. Books must be in audio format. If you're a blogger grab the button and do a quick post about the challenge. Please include a link back to this sign-up post so others can join the reading challenge too. You do not have to be a book blogger to participate; you can track your progress on Goodreads or LibraryThing or on your audible.com or other accounts you have. We will do quarterly updates. Lupe and I will post our updates. You can post your updates in the comments section. A random commenter will be picked for a giveaway each time! Sign up and join the fun. Feel free to leave audio recommendations in the comment section. What a wonderful idea! Love that your are sharing your love of audio this way :) Good luck to all who participate! You ROCK the narration world Xe! It took me 2 tries before loving them too. It's all about finding great narrators. There is actually one audio that is on my list I wanted to get anyway....the second book in the Dust Lands series, Rebel Heart, because the book is written phonetically, and I just can't read it like that. I tried with the ARC of the first one and it broke my brain, so I got the audio instead, at Parajunkee's suggestion. It was great. I think the narrator is a Broadway actress, so go figure. I discovered audio books this year and will be joining in at my reading blog. Welcome! It's great to have ya. I confess to having picked up all the freebie classics on audible a few months ago, even though I don't really listen to audios. Hoarder to the max. This "sounds" like so much fun. I just signed up. I listen to audio books all the time so this is right up my ally! ummm how do I sign up? I listen to audiobooks every day, so I go through tons, as in one a day or every other day. I am so in!!! Just sign up through the linky in the post. I'm in! I love audiobooks! Thanks!!! Looking forward to the challenge & seeing what everyone else is listening to! Ok I messed up a little when I signed up as #23 and #24...sorry about that...I am not sure if it can be erased....but anyway I look forward to being in the challenge! LOL Thanks ok. I deleted one. Oh, I'm glad to find more fans of audiobooks. I definitely will be following along with your challenge, because I love finding people who listen to and review audios, whether they are in the genres I listen to or not. Oh I like this idea of 2013 challenge. I am in! I think I got everything hooked up right, I added a link to a bookshelf I created on Goodreads. If I need to change it up, please let me know. I love the Charley Davidson series on audio. It is a must. Plus, for any Night Huntress fans, that series on audio is really good. This is great! I love listening to audiobooks. They've really helped my road rage. I'm also able to listen at work (depending on what I'm working on). I love the Charley Davidson series (probably my favorite on audio). I also highly recommend the Highlander series by Karen Marie Moning. The narrator does great old Scottish accents. Mercy Thompson is also good (same narrator as the Charley Davidson series). The Hollows by Kim Harrison is done really well (I love Jenks and Kisten's "voices" from this narrator). Cat and Bones, BDB, Merry Gentry, Anita Blake, Kate Danieles are also good. I'm starting The Hollows series on audio in January. Love the button! So excited to be joining in, and I'm shooting for the stars because I did listen to lots of audio books in 2012. Great challenge. I'm so excited to be participating. I've listed my link and the first 3 books of the New Year in my sign-up post. Can't wait to see what level I reach in this challenge. My first audio review is up! W00t! I just LOVE "Rejecting reality one book at a time". That is so me. I read/listened to 352 books in 2012. I have not been keeping track as well this year, but I do average 3-4 a week. My favorite series this year has been the Jane Yellowrock series by Faith Hunter and narrated by my all time favorite narrator, Khristine Hvam. Glad I found this site. I know I'm gonna love it and I will be pumping it to my book living friends and family! I am publishing book in http://www.myinkbooks.com need any recent books or publish contract us freely. I am looking to electronic publishers, publisher, ebook, pub etc.